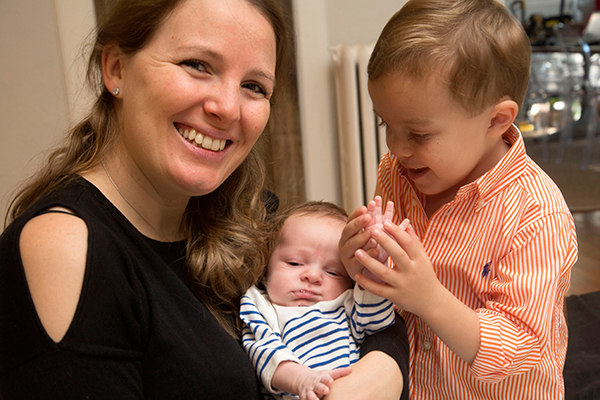 When Diane Allehaux delivered perfect, healthy Louie, he arrived the same way his older brothers did: cesarean section. She knew exactly what to expect, having been down that road before at a hospital in New York City - the epidural, the competent staff and the operating room hustle and bustle. But this time she was delivering at The BirthPlace at Holy Name Medical Center, where some cherished moments turned a seemingly ordinary experience into an extraordinary one: the warm and welcoming environment, the private and spacious accommodations where she was able to share intimate moments with her family after Louie's birth, and the team of doctors and nurses who made her feel safe and comfortable every step of the way. "While it was my third pregnancy and C-section, I was still a little apprehensive - until I met with Sheryl Syby [Holy Name's Administrative Director of Women's and Children's Services]," Diane said. "She put me at ease right away, explaining what I should expect so I wasn't nervous at all." It was a chilly, clear day on Friday, September 29, 2017, when Diane left her Ridgewood home for Holy Name. She arrived by 9 a.m. and was prepped for surgery. Dr. George Ajjan, an obstetrician and gynecologist at Holy Name, met with her, explained what was going to happen during the procedure and alleviated any last minute jitters that might be nagging at the back of her mind. "The care and experience I received at Holy Name far exceeds other hospitals I've been to," Diane said. "My anesthesiologist sat with me before and after the delivery and made sure I was comfortable the whole time. "The nurses were much more knowledgeable, patient and kind," she said. "The rooms are more spacious - even the food was better. Overall, I couldn't have asked for a better experience - it was just amazing." Louie was born at 12:12 p.m. with a full head of dark, beautiful hair and slightly more than an hour later Diane was in her room, cradling him in her arms with her husband. A few hours later, their older boys and extended family members were all there celebrating the newest addition to the family. "I was in the hospital for three nights and everyone took such great care of me," Diane said. "I enjoyed a smooth recovery and everything is going really well. The boys play with their new brother and Louie is actually sleeping four or five hours at a time so things are really good."